At some point in time your Outlook may crash with an error, or simply fail to open. This may be due to a corruption of your Personal Folder / PST file Outlook uses to store your emails, calendar, tasks and contacts records. 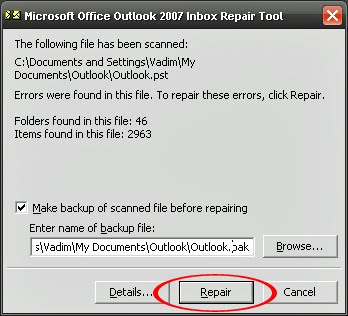 Thankfully Microsoft has included utility called Inbox Repair Tool / scanpst.exe located in your Microsoft Office installation sub-folder. Exact scanpst.exe location will depend on your installed Microsoft Office version as well as actual Microsoft Office installation directory path chosen during initial setup. 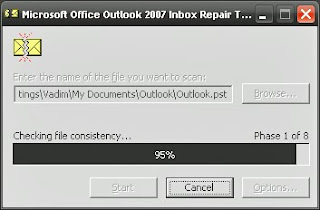 In our example we repair Outlook 2007 installed on Microsoft Windows XP Home Edition computer. If you are unsure about your Microsoft Outlook or Microsoft Office version it may be simpler to use your operating system search function to search for file named scanpst.exe directly (when using Microsoft Windows search feature make sure to enable search hidden files and folders as this file may be hidden by operating system defaults). If we had Outlook 2003 our last sub-folder would be Office11, for Outlook 2002 Office10, etc. Double-click to open it either form the search window, or by browsing to it's physical location on the hard drive. You will see a list of all your PST files along with their locations on your hard drive. 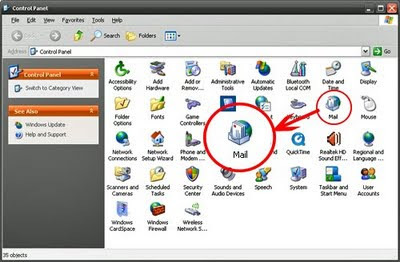 Clicking on Settings or Open Folder buttons will also take you to dialogs where you can see physical location of your PST file (default name is usually Outlook.pst). If you can not copy file location electronically, please write it down on a piece of paper as you need it in the next step. Lets switch back to our Inbox Repair Tool / Scanpst.exe window... Clcik Browse button and use newly opened explorer window to get to previously written down location of your PST file. 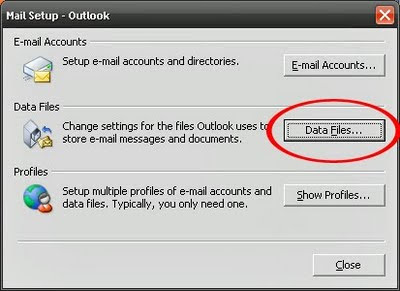 Double-click or select and Open actual file (usually Outlook.pst). Click Start button to begin... Inbox Repair Tool starts scanning your PST file. Depending on your computer speed, available system resources, and size of your PST file this process could take a while. Let it run! You should see dialog below after scanning process has been completed... Keep in mind that your actual report information is going to be different... Review it and click Repair button when ready. Inbox Repair Tool / Scanpst.exe begins actual backup and repair of your PST file... Again, be patient as this process could take a while!!! We have seen a repair process taking over two hours on some older machines with badly corrupted PST files. Do not interrupt this process even if your computer appears to be locked... Run it overnight if you have to. For this business there is a good tool-fix outlook inbox.Program is quite reliable and has got free status as far as I know.Moreover utility can recover data from Microsoft Exchange .ost files and convert them into Microsoft Outlook .pst files. Thank You Alex... Yes, there are plenty of good alternatives. I have a lot of friends and once one of them called me up and told me about his problem. As he said he had a damaged emails. I advised him - ost recovery tool. And yesterday he thanked me a lot and presented me a box of chocolate)). The tool showed me how it converted all information from Microsoft Exchange (files with the .ost extension) into files of the Microsoft Outlook mail client (.pst files) - OstToPst procedure. My sister likes to use MS Outlook. But she absolutely by chance spoiled my tool for seconds. I was unhappy and entered the Inet and started looking for the resolution for my issue. My search was successful, I observed one tool, which might be quite useful in this situation just like me - pst viewer?. There is lot of software which handle every harsh situation related to your PST files and fix inbox problem, but point is that you have idea about the reliable source which provide you best software like i know diskdoctors. I have used it's software and it do perfect job. By using this effective and reliable third party Outlook PST repair software, you can very easily fix any kind of Outlook PST corruption issues without facing any hassle. Thanks for sharing good information related to reliable Outlook PST file repair tools but here is another best option availbable at http://www.tools4recovery.com/outlook-pst-recovery.html which easily recovers corrupt pst files and resolves all pst files corruption issues without any hassle. Along with recovery, it also retrieves permanently deleted emails from PST files. These files are recovered and displayed in Red color for easy identification. Nice article!Convert OST to PST tool to recover corrupt OST files very easily and convert OST email into EML, MSG, PST and HTML formats. OST converter is easy way to conversion of OST files into PST files. OST to PST software successfully supported all version of MS Outlook platform. 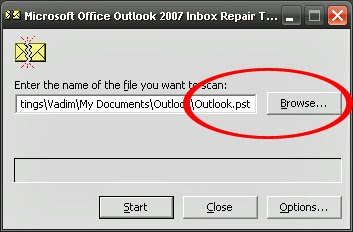 When I tried to repair MS Outlook PST file by Scanpst.exe (outlook repair tool). This tool stop working. I have contacted to Microsoft and discussed my problem. They are unable to sort out this issue. Then I tried this problem over Google and found few useful tools. These tools will fix Outlook PST file and recover all data.